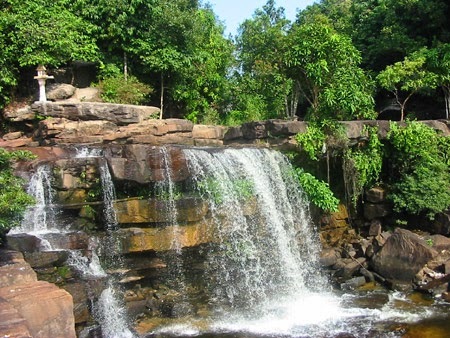 Kbal Chhay waterfall is located in Khan Prey Nup, about 16 kilometers north of the downtown Sihanoukville. To reach the site from Sihanoukville, take National Road 4 toward Phnom Penh. About 7 kilometers out side of town, there is a sign announcing the site. Turn left and go 9 kilometers along a trail. 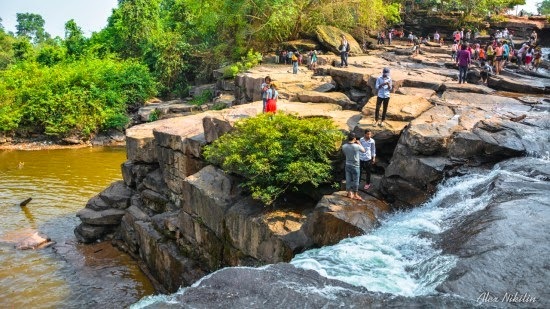 The water at Kbal Chhay comes from many sources along the mountain range, although only three of these sources are visible. The waterfall, which is 14 meters high, is at the point where those three sources joint. The area is slowly being developed and there are now many, many drink stands, food stalls and covered picnic areas available. Lots of local picnickers crowd the area on the weekends. A favorite for local families and teens. Very special is the sitting, relaxing and dining at wooden platforms overlooking the waterfalls. Some are comfortable with hammocks and pillows.